Moves 6-7 were bad from both sides. Neither of the two opponents saw the biggest move on the board. White 1 is sente, because it threatens to cut off a large group of black stones killing them. Black naturally connects with 2. White 3 threatens to capture three black stones with a move at 4. Black has to defend there (cannot stop at 6 - this will be considered below). White 5 attacks one black stone. It is sente because White has a follow-up - a capture will threaten more black stones. White 7 is a mistake. White had to capture the black stone first. See below. Black 8 connects and Black can be satified: his bluff worked. White 9 takes a point from Black and creates a possibility of a point for White. Black 10 should have been at a because that was sente. 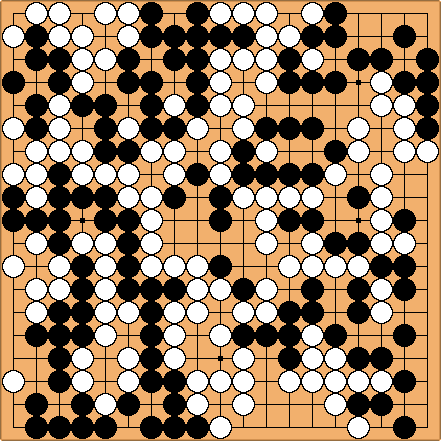 Black loses points by not playing sente moves. White did not use the chance to increase her score ,though. W 3 = 4 points. W 1 = 2 points. B 8 = 1 2/3 points. W 5 = 1 1/2 points. B 6 = 1 point. W 9 = 3/4 point. B 10 = 0 points.